Hubbell-Wiring 4-PLEX® Heavy duty straight blade receptacle in brown color, has high impact and chemical-resistant, polycarbonate face and PBT base construction for long-life durability. 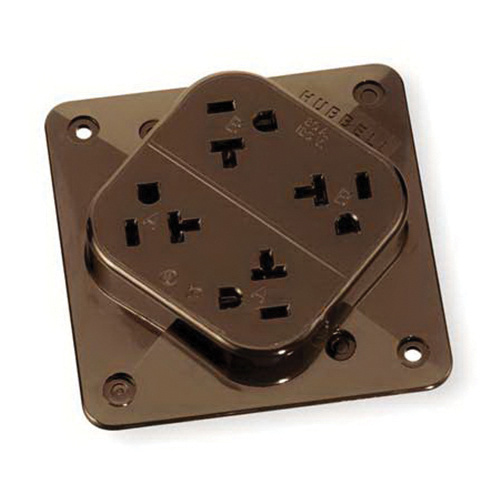 This 2-Pole, 3-Wire receptacle features 0.032-Inch plated steel ground plate, triple-wipe brass contacts and easily accessible break off tabs for split wiring. It operates at a voltage rating of 125-Volts, current rating of 20-Amps, temperature rating of -40 to 75 deg C and dielectric strength of 2000-Volts. It also features anchor hole and loop that secures solid wire for fast and easy terminations. It can withstand a fault level of 1000-Amps. This receptacle supports maximum load capacity of 1 HP. It is suitable for commercial environments. The straight blade receptacle meets UL 498 File E2186, CSA 22.2, No. 42 File 285 and NEMA® WD-6 standards.